With some series it is impossible to say which edition is the best. Pose that question to a gamer and prepare yourself for the ensuing debate as fans of Hitman, GTA or Elder Scrolls argue it out in great detail. The same cannot be said for Age of Empires. Popular opinion is that the second edition is the overwhelming front runner, supported by Microsoft’s re-make and re-release of it ahead of the first title. But that’s the situation we find ourselves in, but why give the first Age of Empires a makeover to mark 20 years since its release? Why got back to this Age? Well, it probably needs you to consider your view on the ancients . A benefit of Age of Empires: Definitive Edition is that, unlike some of it competitor titles, the franchise has always steered away from trying to use the whole history of man in one title. The pioneer Age of Empires was embroiled in our ancient ancestors – the Greeks, Egyptians, Phoenicians, Persians and the Romans. If you are not too worried about the minutiae, then the differing ages and terminology might not be a major issue, but Age of Empires has always been about the history. It’s what first drew me to the series – every battle, every season was entrenched in its real history. The “Ascent of Egypt” campaign, as an example, is essentially the teaching campaign teaching new gamers how to build, farm, train troops and master the basics of attack. These are all the necessities of the genre, but it seems pretty extensive my modern standards. This is the thing about Age of Empires – it’s always placing the action within the context of history. You most certainly are not just learning how to best use the River Nile in order to maximise your crop growth or creating unity among warring factions, you’re preparing for bigger and better things against some of the biggest names in history. 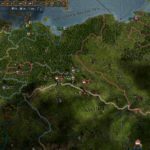 It’s what makes it unique – you don’t have to look too deeply into the mechanics of the game to find the differences between titles (as you might do with Civilization offerings). The differing themes give you variety because you’re not simply playing in one historical period in order to progress to the next with bigger, better weapons. You play Age of Empires for that moment, not the next. 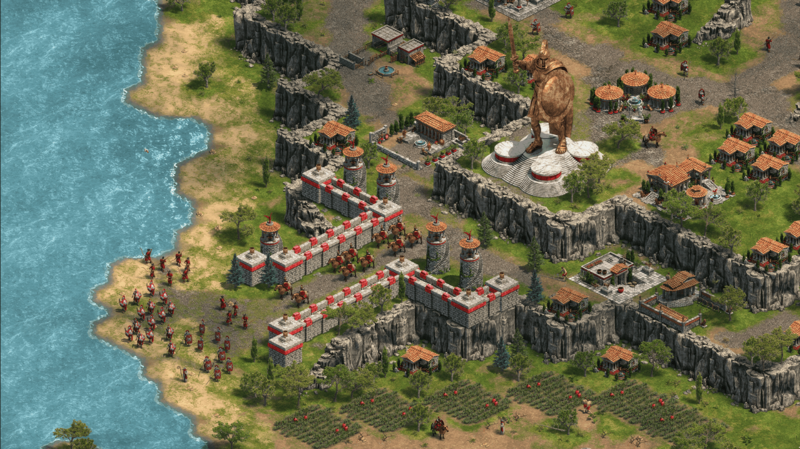 Having said all of this, Age of Empires: Definitive Edition is noteworthy because of its links to the original title – that’s what peaks the interest and captures the nostalgic imagination. There is an HD version of Age of Empires II, it’s not particularly new, and it’s still better than this. I do feel that there are plenty of desirable things that feature in Age of Empires II but aren’t in the game. A major one is gates – you can erect walls, but there isn’t the option of doing the same with gates which means you can either besiege yourself inside, or use walls to create a bottleneck as opposed to a fully defendable structure. There is also the fact that Age of Empires II is more creative with its factions. Each civilization had its own bespoke units which had a major impact on the way matches played out. This can be seen even more clearly through the release of the HD expansion packs The Forgotten, Rise of the Rajas and The African Kingdoms. When you then compare this with Age of Empires: Definitive Edition it feels slightly bare. It’s never right to be fighting against Roman Phalanxes in the hands of Egyptians and crucially, it contradicts the desire the game has to gain a reputation for putting history at the forefront of everything. The factions all play in a pretty similar way with only small differences to note. Whilst this makes things easier, it leads to a stagnant feeling – if you’ve played one match, then there really isn’t a huge amount more for you to see. This is all fair enough in the late 1990s but to entice a 21st Century gamer, where a re-mastered sequel with new expansion packs already in the public domain? This sticks in the throat a little. None of these issue change the fact that Age of Empires: Definitive Edition is a quality re-make. As I’ve previously said, I enjoy the nostalgia of a game that evokes memories of a different time and this certainly does that. Aesthetically it is amazing and Forgotten Empires certainly matches the quality of Age of Empires II HD which is an achievement in itself. And there are some cracking new additions. You can enjoy bigger and more spectacular battles thanks to an increase in population limits. The game also plays faster as a default setting and you have the option to speed things up or slow them down as you like. I would say though, that the “Fast” speed the game starts on is about right because it stays true to the original but offers sufficient pace for the modern gamer.